This is a cabinet card showing Thomas J. 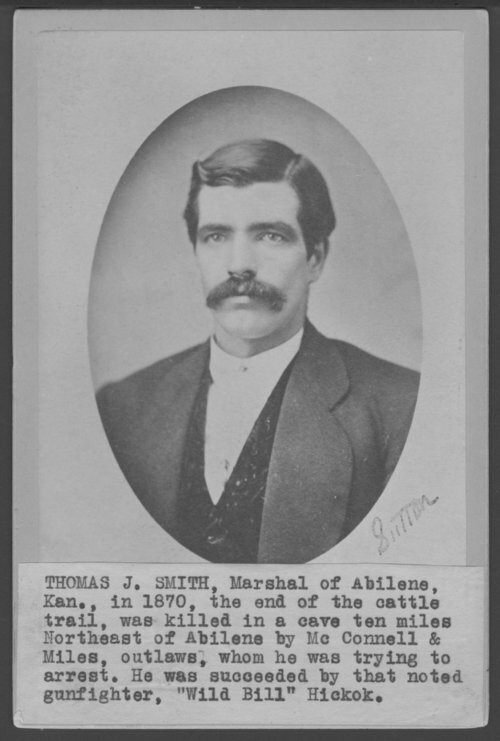 "Bear River" Smith, Abilene's first chief of police. He was hired on June 4, 1870, for one month, but he stayed on the force until his death in October 1870. While trying to arrest Andrew McConnell, who was accused of murdering John Shea, Smith was shot in the chest. Smith fired back wounding McConnell. A fight ensued and Smith was eventually struck in the head by a gun wielded by Miles, a friend of McConnell. After hitting Smith in the head, Miles seized an ax and nearly decapitated Smith. McConnell and Miles escaped and were captured three days later.